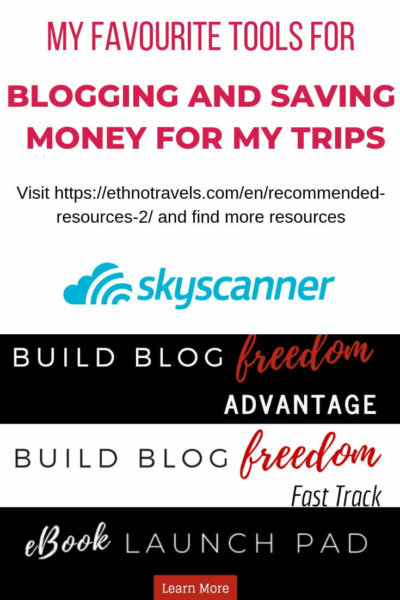 I am often asked what resources I use to blog, prepare my trips and pay for them. Using the right sites is necessary because it saves a lot of money, time and efficiency. So you will find on this page a list of sites that you can use to prepare your next trip easily and at the best price, as well as the tools I use for blogging. These are companies, sites and tools that I use regularly and recommend every time I am asked questions. Online courses and free challenges. Resources to prepare your trip. My favorite airline: Qatar Airways. Compare flight prices, find flights at the last minute, leave on an impulse with Skyscanner. Hotel reservations in Asia – or elsewhere – with Agoda. My other favorite site for hotel reservations: Booking. Check the opinions of the users of the hotel you want to book on Trip advisor. Book your table at the restaurant with LaFourchette. Book tickets and tours with Get Your Guide. Tickets and tours in Asia with Klook. Booking bus, train, ferry and flight tickets in Asia with 12go.asia. Resources to make the unused space profitable. Resources to save with Amazon. Try Amazon Audible and get two free audiobooks. Last year, I decided to invest in the English courses of an Australian blogger, Sharon Gourlay, whom I had been following for several months on Facebook and whose free content was already giving me a lot for the creation of this new travel blog – I chose to “start from scratch” with a new domain name and new content rather than “relaunch” my old blog Amatu Artea. in SEO, which, among other things, brings me 75% of my online traffic today, has allowed me to structure my site in an optimal way, allows me to be more quickly present on the 1st Google search page even for competitive keywords and even to have links from Wikipedia. in affiliate marketing, which now allows me to generate regular revenue with Amazon and diversify affiliate programs. on Pinterest, from which I now get regular traffic. For example, I could get 3 000 views in only two days from my pic with Joalduns in Bayonne carnival when I hardly could get 100 views before the course! The best part is that hotels now want to work with me because of my Pinterest account. on how to work with brands. And I still have a lot of modules to do and new things to learn about product development, ebooks, other social networks, sponsored articles, etc. Build Blog Freedom Fast Track, a 10-week program to learn everything about SEO, affiliate marketing, define your site’s niche and work on your objectives and your mindset. Click here to see the full description. eBook Launch Pad, to learn how to design an eBook from A to Z and market it effectively. Click here to see the full description. I was reluctant to pay for courses when you can find a lot of free information online. But I was convinced thanks to the trial offer I received and during which I was able to see how Sharon gives concrete examples, with actions to be implemented as we went along. She does not content herself with generalities but explains in concrete terms what to do. If you are hesitant to register right away, I recommend that you take one of the free challenges or one of the free Masterclasses to see if Sharon’s teaching is right for you. You will benefit greatly from it. On this page, I regularly inform you about the offers and promotions that Sharon offers. Sharon is opening her new Build Blog Freedom Fast Track course to new students for a limited time. Until March 7, 2019 only, also take advantage of a special introductory offer ($100 discount if you pay in one go or $97 on the monthly payment). Click here to take advantage of this exclusive offer. Keysearch is the keyword search tool that most professional bloggers use. It allows us to search for the best keywords to use to be visible on search engines and even on YouTube. It also offers many features such as tracking the position of your main keywords, competition analysis or the content creation wizard. Get a 30% discount on your Keysearch subscription with the KSDISC discount code. All the resources I use to prepare my trips and that I recommend to you. Qatar Airways is the airline I use every time I go to Asia. For my 3-month trip to India in early 2018, I wanted to test Oman Air because Qatar Airways is less well positioned on prices for India and especially for a trip of more than a month. I really regretted my choice: old and noisy airport on the way, very dirty toilets, less good meal platters, less choice of entertainment, lower service. Check prices and availability for your next trip to Asia, Oceania, Near or Middle East by clicking here. Skyscanner is for me the best search engine for flights. The features offered allow advanced searches to find the best flights and choose your next destination. Make a price comparison or search for your next destination on Skyscanner’s website by clicking here. I do not always book my hotels and guesthouses in advance when I travel. It depends on the time I arrive in each of my stopovers and the offer on Agoda (if there is a place that really stands out from the crowd, I book in advance to make sure I will stay there). Over time, I discovered that Agoda was the best place to book hotels and guesthouses in Asia. In addition, I earn points on my Qatar Airways loyalty program when I book on their website! Be careful with the offers of some comparators or sites, which may seem cheaper, but do not include the site reservation fees. In the end, you pay more! Check prices and availability for your next stay on the Agoda website. I used Booking for a very long time, until two very bad experiences in Nice: Brigitte Guesthouse which is absolutely not a guest house and insulted me when I complained, the Armenonville hotel which asked me an exorbitant tax for my little westie, accused several customers including myself of wanting to leave without paying and blackmailed me asking for a good review (no tax for Jahan if I hide their execrable behaviour). I come back little by little to the site, which is still very practical and well positioned on the price-quality side. Check hotel prices and availability for your next trip on Booking here. The information you can get online is interesting, so I have always checked the opinions of previous guests of the hotels I want to book on the Trip Advisor website. Check here for customer reviews for your next hotel reservation. I discovered the site and application of TheForks in the summer of 2018. Thanks to TheFork, you can not only book your restaurant table directly on the site or app, but also save on your bill as the company often launches promotions. Book your next meal at the restaurant on TheFork website here. Get Your Guide allows you to book your tickets for attractions such as the Eiffel Tower and Disneyland and tours from a few hours to several days such as the discovery of Basque tapas, pintxos, in San Sebastian and the guided tour of the Vatican. Book your tickets or tour on the Get Your Guide website here. I also recommend Klook’s more extensive and inexpensive offer for tickets and tours in Asia. In one of my Facebook groups, I recently heard very good comments on Klook, both on their excellent offer and customer service! Book your tickets or your tour on the Klook website here. 12go.asia allows you to book all your transport in Asian countries. Book your public transport on 12go.asia’s website here. Airbnb and Booking offers to list a room, apartment, house on their site in order to list your property for vacation rental. This can be a good way to promote your rental and get customer feedback for use on your website. Use this link to list your rental on Airbnb. Use this link to register your rental on Booking. Amazon offers various services to save on your purchases. – fast and free delivery. – priority access 30 minutes before the official start of eligible flash sales. – streaming access to films and series, including the Prime Original series. – up to 40 hours of music per month without advertising. – free access to more than a thousand books, magazines, comic strips, kindle publications. – a secure and accessible 24-hour storage of an unlimited number of photos. Click here to get your two free audiobooks. This article contains some affiliate links that allow you to reserve your travels and buy things at the best price. If you use it, I earn a small commission at no extra price for you. Products and services promoted or advised by an affiliate link have been tested and approved by Ethno Travels. Thanks in advance!